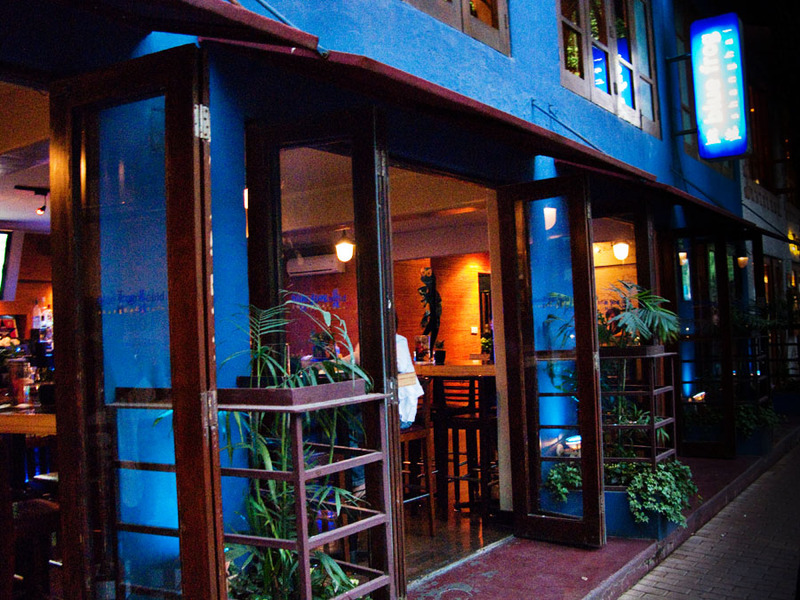 From the folks who brought you Kabb comes Blue Frog bar and grill. 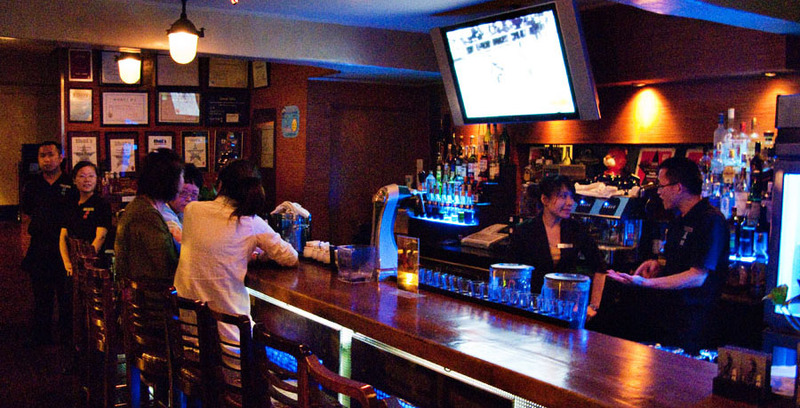 Another super chill place to hang out with friends, watch the game on the big screen, meet up for happy hour after work, etc. while enjoying classic American comfort food. I visited the South Maoming location (their first and original location) near the French Concession and got myself a dose of home in Shanghai. I had been having a tough week. Between a relentless work schedule and recovering from a pernicious bout of the flu, I was feeling the tiniest bit homesick. So when a friend invited me out to Blue Frog and said it would give me a solid boost of Americana, I thought why not? We took a high table with bar stools by the window and perused the menu. While there are a good amount of beers on tap, I wasn’t sure I was feeling up for alcohol just yet. But between the burgers and pastas and steaks, one thing did catch my eye – fajitas (80 RMB / S$16 / $12 USD)! 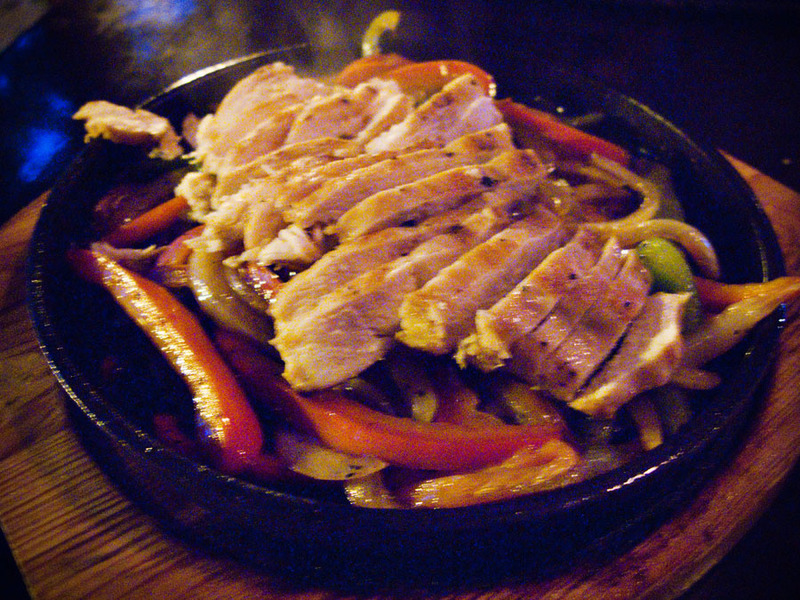 I haven’t seen fajitas on a menu in Asia, well, in a very long time… I couldn’t resist. My plate of sizzling fajitas was served (as it should be) on a cast iron skillet and came with all the standard fixings – guacamole, salsa and sour cream. The smell alone reminded me of some favourite Mexican haunts in NYC. And suddenly, just like that, my previously lackluster appetite was stimulated and I couldn’t wait to dig in. As I filled tortilla after tortilla with grilled chicken, peppers and onions, I felt the tension melt away and sensations I hadn’t enjoyed in days – relaxation and pure satisfaction. After the meal I was markedly perked up. So much so I decided to indulge in a Chocolate Martini for dessert! Exotic it ain’t…at least for an American like myself. 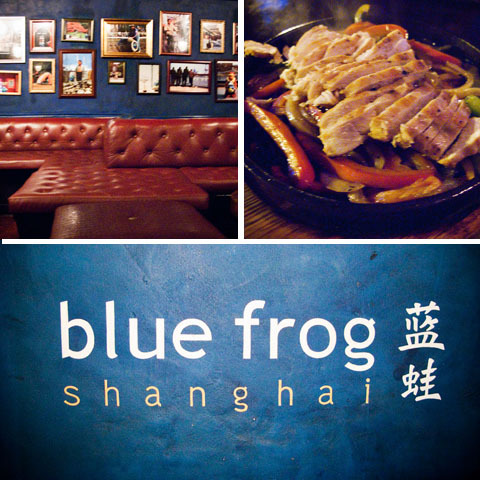 But that’s exactly the point of Blue Frog. Have a beer. Meet some friends. Enjoy some snacks. Soak in the chill vibe and let your hair down. Thanks and great that you enjoyed your time there too!